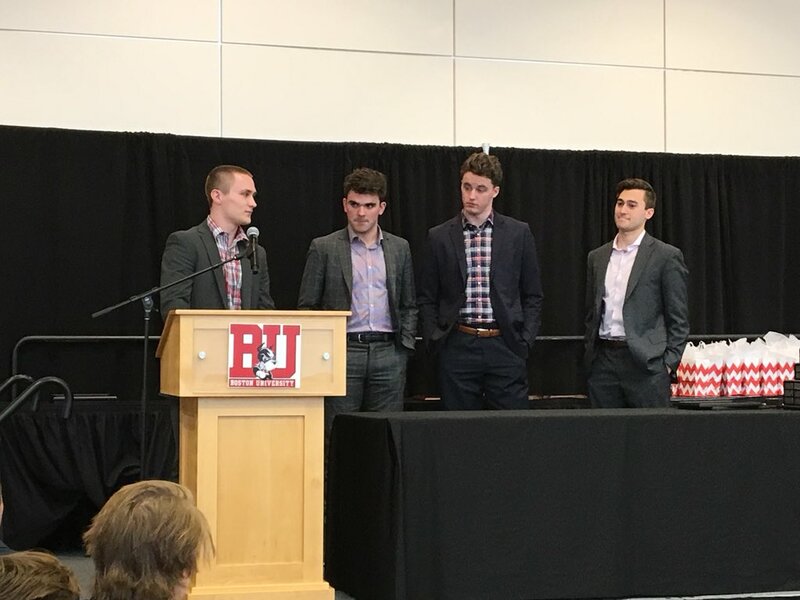 At the 55th annual Friends of BU Hockey Banquet on Sunday, perpetual team awards and the leadership team for 2018-19 were announced. The event was held in Agganis Arena’s Burke Room with Bernie Corbettagain serving as emcee. Rising senior Bobo Carpenter and rising junior Dante Fabbro will co-captain next season’s team with a pair of juniors-to-be, Jake Oettingerand Chad Krys, serving as assistant captains. Carpenter and Jordan Greenway, who is currently playing for Minnesota in the Stanley Cup playoffs, shared the George V. Brown Most Valuable Player Award. The two forwards, who tied for the team scoring lead with 35 points, also were co-winners of the Ed Carpenter Award for most points. Carpenter captured a third honor, the Iron Terrier Award. Grad transfer Drew Melanson took home two awards, Most Improved Player and Unsung Hero, while senior captain Brandon Hickey won the Bennett McInnis Award for Spirit. Two annual scholarship awards also were revealed. Fabbro also received the Clifford Fitzgerald Scholarship, award to a rising junior or senior defenseman. Freshman Cam Crotty received the Regina Eilberg Award for top scholar-athlete. ► Director of Hockey Operations Brittany Miller will be competing in Monday’s 2018 Boston Marathon, her first appearance in the famed Patriots Day event. Miller became the Terrier DHO in the summer of 2016 after having been a team manager for five seasons. She received her undergraduate degree from BU in 2015 and a Masters in Mass Communications in 2016. Miller will compete for the Shawn Thornton Foundation team. In a pre-tourney exhibition game prior to the IIHF World U18 Championships, 2018 recruit Joel Farabee scored two goals and picked up a pair of assists in Team USA’s 15-0 rout of France. Former BU Captain Doyle Somerby scored his first goal of the season in the AHL Cleveland Monsters’ final game. He finished his rookie season with 8 points in 38 games.